The Topic or Question of the Day? Do you know what makes food products taste rich and creamy? Answer: Carrageenan, Xanthan gum, Guar gum, carob bean gum, locust bean gum, inulin, and pectin. What is with all the gums and oddly named ingredients? My Dad used the phrase, “You gummed it up,” meaning, I made a mess or ruined something. I believe the food industry is “gumming up our foods” and I also see a connection with many gastrointestinal problems from these additives. Foods such as salad dressing, yogurt, ice cream, milk, almond/coconut milk, coffee creamers, and cream soups often contain ingredients that make a food taste and feel rich and creamy. These ingredients are used in many low fat or fat free products to make them low calorie by taking fat out, or by taking a fluid food and thickening it to have that good mouth feel. I urge you to read food labels and the ingredient lists. I am not an alarmist, but over the years, I see these ingredients permeating our food supply. I spent over an hour at the grocery store looking for items that do not contain these ingredients. I only found one type of cottage cheese (Daisy), 3 types of yogurt (plain Fage, plain Chobani, and plain Voskos), and 1 coffee creamer (Coffeemate Naturals, sweet cream flavor) at my grocery store that did not contain one or more of these phonies. You can find foods that are pure, but will take some time and effort. Inulin is a fiber infiltrating many of our food products and is found naturally in the Chickory root and Jerusalem artichoke. It doesn’t digest in our upper GI tract and reaches the colon where it is fermented by intestinal bacteria. People react differently to various amounts of inulin with side effects from mild to severe. A balanced article, presenting both sides is: Inulin: Friend or Foe by Patty Donovan. The ingredient that scares me the most is carrageenan. It is manufactured from seaweed and algae. I have read numerous articles both defending and condemning carrageenan and I have also seen many people negatively affected by consuming it. I encourage you to read articles for yourself and decide. Like I said, I am not an alarmist, but if I can find a product I like without these fillers, I would rather eat the real food whenever possible. 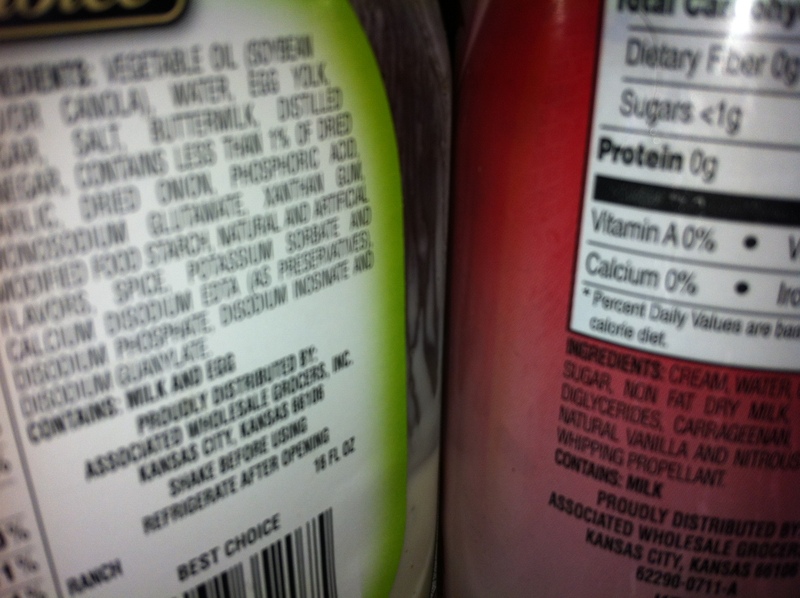 Try not to buy fruited yogurt, as most contain the ingredients mentioned above. Use plain yogurt with out these fillers and add honey, pure maple syrup, or honeyed fruit if you like your yogurt sweet. * Research some articles and think for yourself. * Try making honeyed fruit for your plain yogurt. Place any fresh or frozen fruit in a saucepan such as peaches, berries and pears and barely cover with cool water. Sweeten to taste with honey. Bring to a boil for a few minutes until reduced a bit. Chill in glass container. Lasts at least 2 weeks in the refrigerator.